A lot to say in a small space in this concertina A6 brochure. A piece which can be conveniently handed out by other associated companies showing the exciting range of products and services on offer at Forum Interior Design. A. High end estate agents, (& hoteliers, professionals etc). These will pass on the leaflet to their contacts/clients and need to be confident that Forum is the best choice for them and that by recommending Forum they can be seen as aiding their own clients. B. Home owners. Wife makes the decision although husbands add input. Either looking for a new or refreshed look or a spruce up before putting their property on the market. They would like something a bit different and unexpected even if they go for a more traditional solution in the end. Want home to be full & look lovely straight away. Forum stand out from the others because they show something a bit different, whilst still being sympathetic to my character house. They also have such an extensive range of products. I really like their different services. 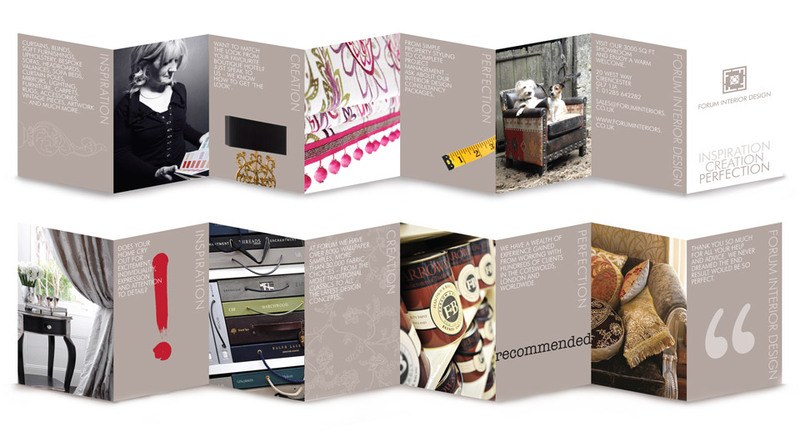 Forum Interior Design are the most creative and resourced company I could possibly go to in the area. Forum Interior Design now have their details given out by advocate companies and reach potential customers who otherwise may not know of them.